An enterohaemorrhagic Escherichia coli (EHEC) outbreak occurred in Germany in May and June 2011. Thirteen other European countries have together reported a few dozen cases. Almost all infected persons outside Germany had travelled to or lived in Germany during the incubation period. 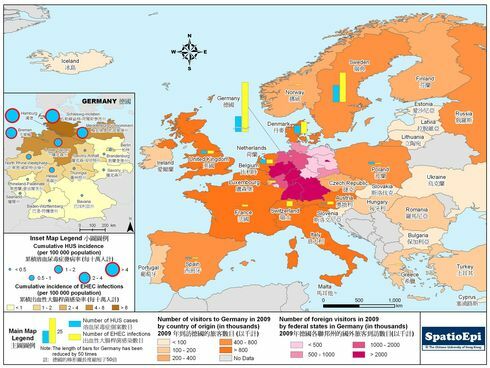 The map shows the 2011 EHEC outbreak situation, against the background of the number of European visitors in Germany in 2009. Between onset of the outbreak through 15 June, there were 786 haemolytic uraemic syndrome (HUS) cases and 2517 EHEC infection cases in Germany. Cumulative incidence of HUS and EHEC infection was higher in federal states in northern Germany such as Hamburg, Schleswig-Holstein, Bremen and Mecklenburg-Vorpommern (inset). The bar charts in the main map show the distribution of cases in countries adjacent to Germany including Netherlands, Switzerland, Denmark and Sweden. Of these, many were also the top sources of visitors to Germany, as depicted by graduated colours in the map. The preference for south-western federal states of Germany by foreign visitors is also shown. The discrepancy between regions heavily affected by the EHEC within Germany and major destinations for visitors may explain the relatively localized pattern in the outbreak. Data for the map were obtained from Federal Statistical Office of Germany, World Health Organization Regional Office for Europe and Robert Koch Institute. Escherichia coli (E. coli) is a bacterium commonly found in the guts of humans and other warm-blooded animals. Most strains of E. coli are harmless, but some can cause severe food-borne disease by producing toxins called shiga-toxin. In response to the German outbreak and the seriousness of the disease, Shiga toxin-producing E. coli infection has been included as one of the statutory notifiable diseases in Hong Kong since June 2011. Symptoms of infection include abdominal cramps and diarrhoea, which may be bloody. Fever and vomiting may also occur. E. coli infection is usually transmitted through ingestion of contaminated water or food. Therefore, hand washing, especially after using bathroom or changing diapers and before preparing food or eating, is an effective preventive measure. Cooking meat thoroughly and avoiding raw milk and unpasteurized dairy products can also prevent human from infection.